Alzheimer’s and Dementia Archives | Central Coast Senior Services, Inc.
Alzheimer’s Association of Monterey County: The Alzheimer’s Association is the leading national voice for people with Alzheimer’s disease and related disorders, and their families and caregivers. While the staff are rightfully proud of their many programs and services – education, patient and family service, advocacy and research – Director Sherry Williams says, “I believe our most important role is to speak for those who are no longer able to advocate on their own behalf.” Sherry and her staff at the Monterey Chapter of the Alzheimer’s Association are an invaluable asset to our community. MSSP offers free social work and nursing services to medically isolated, frail and underinsured older adults who are at risk for premature institutionalization or loss of independence. They provide care management services to assist clients with daily living needs so that they may live healthy, active lives. There is no charge for MSSP services. Dr. Trish McKeon: Dr. Trish McKeon has 35 years experience in helping patients and families understand and cope with Alzheimer’s, memory loss, brain injury, and other cognitive disorders. ElderConsult: ElderConsult Geriatric Medicine is a house calls practice providing premium medical care to patients. Their staff includes board-certified Geriatricians (physician specialist in care of elders) and Geriatric Nurse Practitioners. They are experts in medical and behavioral challenges. 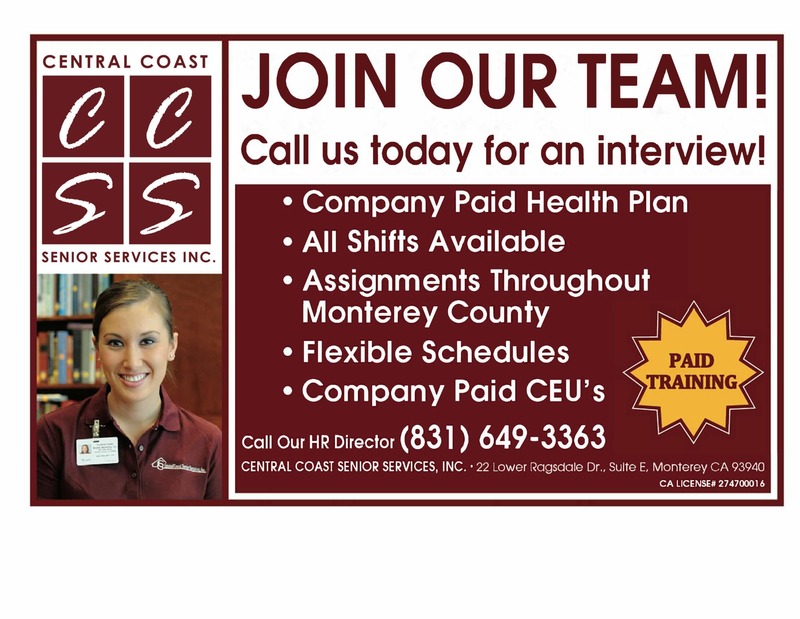 Their San Francisco Bay Area practice has extended to services within Monterey County. Stanford Center for Memory Disorders: The Stanford Center for Memory Disorders is dedicated to the fight against cognitive decline. There are many different causes of memory loss, and an accurate diagnosis by an experienced team is essential to getting the best treatment. The Center is one of approximately 30 National Institutes of Health (NIH) designated Alzheimer’s Disease Centers in the United States, as well as a designated Alzheimer’s Disease Research Center.